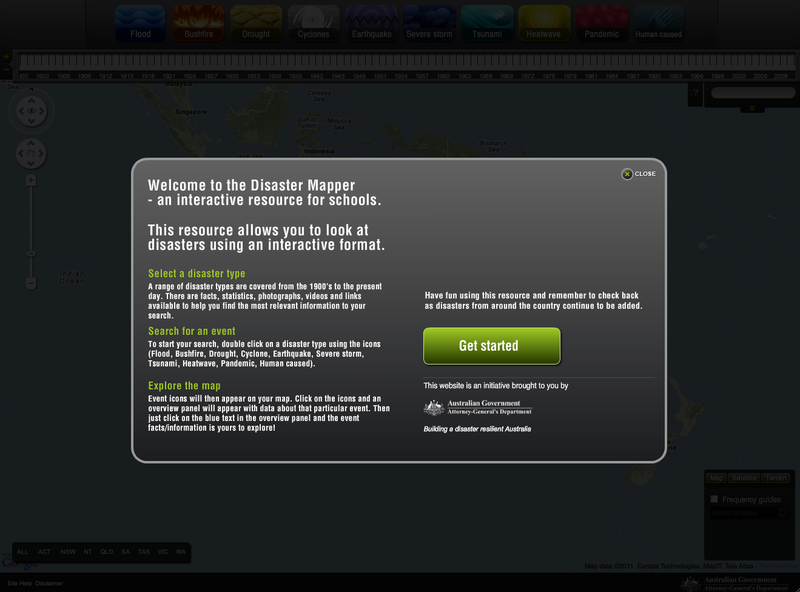 The Disaster Mapper - An interactive Resource for Schools is a project for the Attorney-General's Department, Australian Emergency Management Institute. 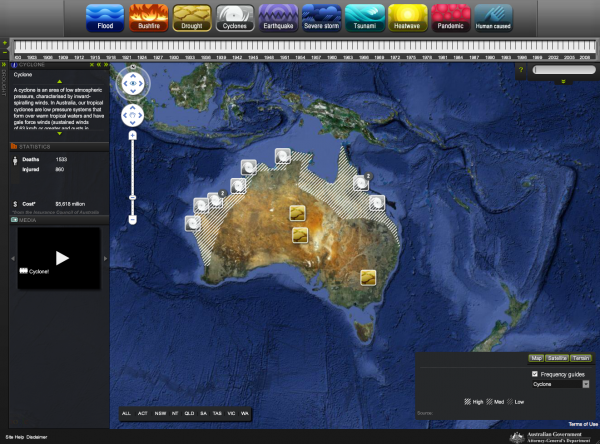 The aim of the project was to provide an educational resource aimed at school students for investigating Australian natural disasters throughout history. It was developed in 2009 but has just been released to the public. 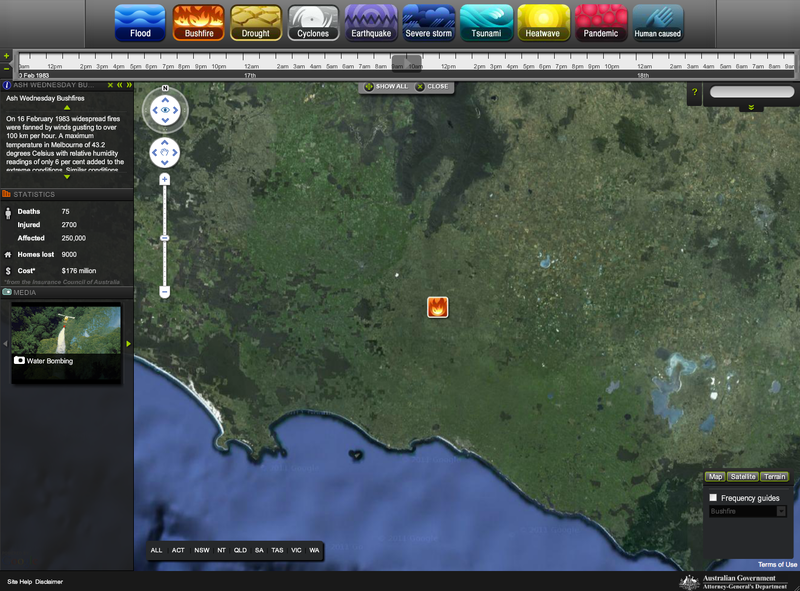 This project made use of the latest Flash technologies with the Google Maps API to provide an interactive map where users could navigate and search disaster information by time, location, disaster types and keywords. 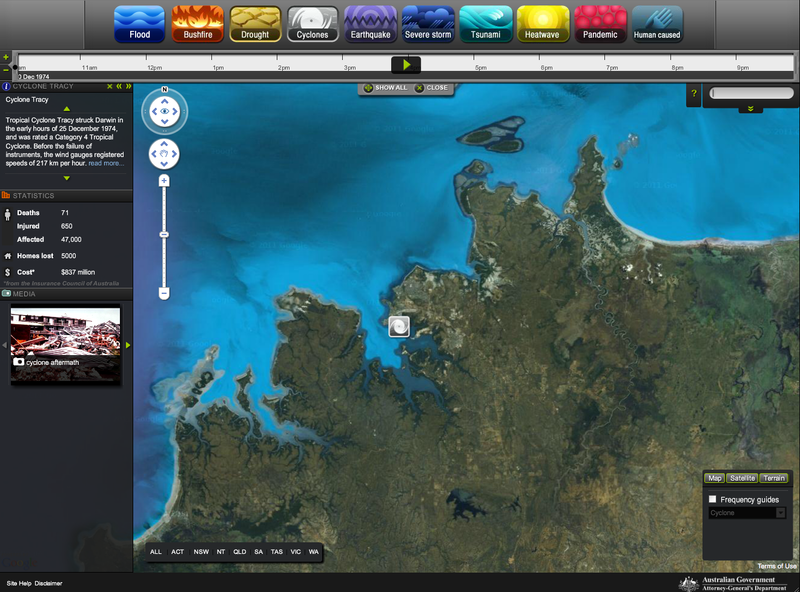 The application uses a very simple series of navigational elements. A series of large buttons allows the user to select the disaster categories of interest and a timeline allows the user to limit the time period displayed. 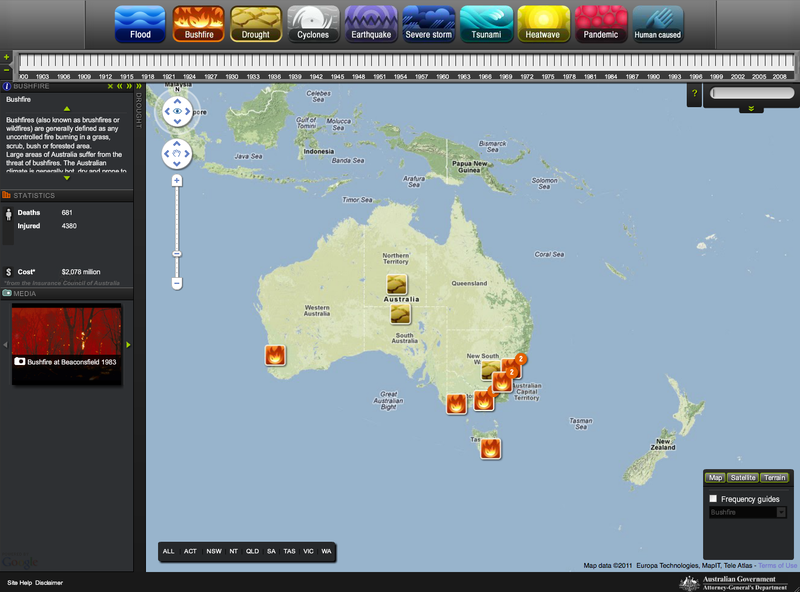 The disasters matching these two filters are then displayed on the map along with overview information of the selected disaster categories in the information panels on the left. 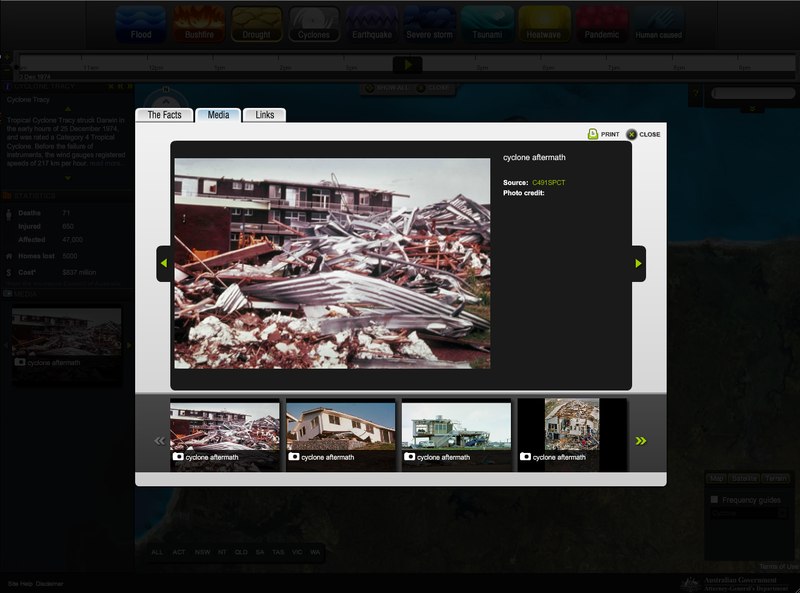 Media associated with each disaster (including images, flv, youtube, viemo, mp3 and other media types) can be viewed either in quick view in the information panels or in the detail overlay. The system also supported and included additional data such as population, temperature, rainfall and specific high-risk disaster areas which could be overlaid on the map. The result is a very easy-to-use, interesting website and something suitable for the target audience of school students. Making use of some extra available time, distriqt also developed an additional component for the CMS which allowed an administrator to directly edit overlay data on top of a Google Map, using a standard data format (KML). 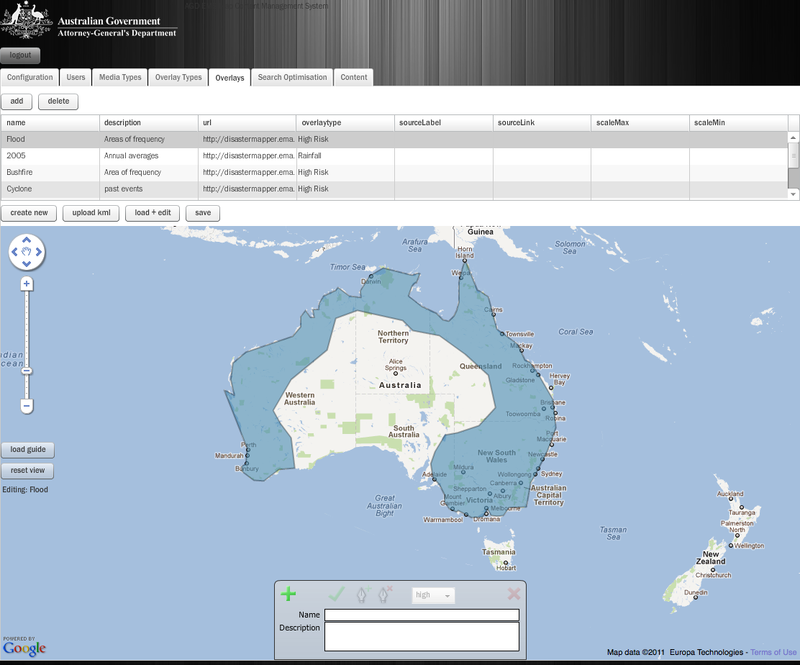 This allowed the client to create more meaningful and suitable overlay information for the website such as risk areas, temperature, population and rainfall data. The project was delivered on-time and on-budget, and has been well-received by the client, schools, and educators - all feedback has been very positive.